Marta Owczarek sees this Mercury-nominated act live and finds a performance that is full of conviction, with no hesitation and no second-guessing. Savages have been hyped for over a year now, with a line of sold out shows and the super anticipated full-length Silence Yourself, which is getting plenty of appreciation from London record shops (number one at Sister Ray and number two at Rough Trade). The Mercury Prize critics didn’t go with this, but someone clearly did and booked Savages to play The Kentish Town Forum, their biggest show to date. If this is a band who has never played to an audience this big before, they’re either lying or naturals. Their confidence shines brighter than the lights, and those are really something else too. 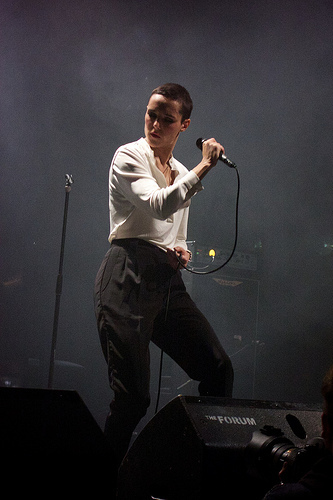 Jehnny Beth stands astride onstage at The Forum, with her left leg slightly raised, holding up the microphone in her right hand. She wears a long-sleeved white top with black baggy trousers and looks down, with a serious expression, over her right shoulder. The stage is filled with dry ice smoke, giving a grey wash to the background. By Paul Hudson, shared under a Creative Commons License.